So if you haven't been paying attention to the past few posts, then you might not already know that Is Your Buffalo Ready for Kindergarten? 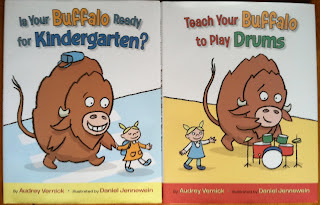 and Teach Your Buffalo to Play Drums are among my favorite picture books of all time. I got to meet the illustrator, Daniel Jennewein, on my recent trip to Germany, and now Audrey Vernick has agreed to stop by for an interview. Foodie Bibliophile: OK, so what inquiring minds want to know is: why a buffalo? Why not an elephant? Penguin? Monkey? What made a buffalo seem like the perfect character for a picture book? Audrey Vernick: I have realized, in answering this question, that I am a lazy, uncreative, uninspired thinker. Years ago, in response to my dog's interest in some pumpkin muffins, I said to my son, "You're going to need to teach your dog to bake." I added that I should just sit down and write a whole series of children's books, beginning with that title and continuing with Teach Your Cat to Surf and Teach Your Buffalo to Play Drums. The last one stayed with me. It kind of wrote itself that day. And it never once occurred to me to seek out another animal--it just was a buffalo. That was made ever-more true when Daniel Jennewein, the brilliant, entered the picture. Once I saw his pictures, the idea of a buffalo was transformed into THE buffalo, that buffalo. His buffalo. Our buffalo. FB: What part of the process did you team up with Daniel Jennewein as your illustrator? AV: Daniel had met the HarperCollins art director in Bologna and she had seen some of his artwork, including, miraculously, a drawing of a buffalo. My understanding is that he was asked to provide some sketches while the book was still in the acquisitions stage. His sketches were, of course, hilarious and wonderful. I was thrilled when he agreed to illustrate the books. I can't imagine what these books would be without him. FB: What was your reaction when you first saw Daniel’s illustrations for The Buffalo? Many picture book writers describe themselves as visual thinkers. I am whatever the opposite of a visual thinker is. I don't write text with a visual image in mind. I try to leave room for the illustrator to tell his/her story, too. Seeing the first visual representation of my words always feels like a gift from the artist to me. With buffalo, it was my first illustrated picture book, so it was a profound gift. A much-loved gift. An exactly right gift. FB: In looking at your body of work, your first two picture books were nonfiction and more educational in nature, how did it come about that you went from informing kids to making them fall off their seats laughing? AV: You made me blush! I don't know if I have an answer for that other than luck. Well, there was something that happened around the time I switched from one agent to another. A little background: my first agent, a fabulous agent, was well established in the adult fiction market. I wrote both adult and children's fiction when I signed with her, but kept skewing ever-younger in my writing. She did not know the children's market well, so I spent a lot of time figuring it out and requesting specific submissions. Once I signed with my second agent, who is well established with children's publishers, all the energy that had gone into market-oriented thoughts was freed. I don't think it's a coincidence that that is precisely when I started writing funny books. FB: When did you realize that The Buffalo was more than just a one-hit wonder? AV: When HarperCollins signed the book (the one I submitted was TEACH YOUR BUFFALO TO PLAY DRUMS), they offered us a two-book deal, a wonderful show of faith in a brand new character. IS YOUR BUFFALO READY FOR KINDERGARTEN? was written second, but published first. AV: We hope so, too. That decision lies with our publisher. FB: Your first novel, Water Balloon, is coming out in September. 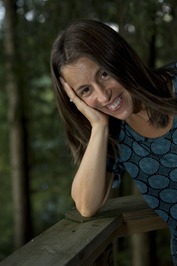 How did you go from picture book author to novelist? AV: I wrote an earlier version of WATER BALLOON before I wrote any of my published picture books. I came to children's writing by way of fiction writing. I received my mfa in creative writing (fiction) from Sarah Lawrence College, and for more than a decade, I wrote literary short fiction for adults. Within that world, it's assumed that just about writer has a novel in her, so it might have felt inevitable for a long time. The other push was the desire to find an agent. The thinking at the time--and to some extent, to this day--was that it's easier to get an agent with a novel than with picture books. FB: What is your writing process like for a novel compared to a picture book? AV: I liken it to very painful, long-lasting torture compared to a brief and delightful romp at the beach. Seriously--right now, I'm trying to find my way through a first draft of a new novel and it's killing me. Picture books come relatively easily. I rarely have to force myself to write--I enjoy writing picture books. Working on them fits into the little pockets of time my life naturally provides. For novels, I send my family away. Or I go away. And I try to write thousands of words each day, just to get through the misery of a first draft. I seem to recall liking it more once the first draft is completed, but right now, I'm in the poorly ventilated mines and it's darkness in all directions. FB: Since you are so varied in your writing abilities, I’d love to know what some of your favorite reading experiences have been, either as a child or an adult. AV: Mmm! I love that question. I've been thinking so much about childhood reading experiences, as they're discussed a lot on my new blog (http://literaryfriendships.wordpress.com). I remember the very strong connection I felt to the main characters in HARRIET THE SPY by Louise Fitzhugh and THE SECRET LANGUAGE, by Ursula Nordstrom. I have a nearly visible love for Scout and Jem, book and movie versions, from TO KILL A MOCKINGBIRD. A strange and incomplete list of favorites: Lorrie Moore's short fiction, memoirs by Mary Karr and Frank McCourt and Dave Eggers; The Magician's Assistant by Anne Patchett; the three adult novels by Alison McGhee. I actually stink at listing favorites, so this is a woefully incomplete list. For children's books, you can't beat this one, by my friend Olugbemisola Rhuday-Perkovich: 8TH GRADE SUPERZERO. FB: Thanks so much for stopping by Audrey! I can't wait to read WATER BALLOON and we'll hopefully be on the lookout for more Buffalo books in the future! all of these books look so good!! i hadn't seen water balloon yet. Love the interview!! Love your books!! Lazy, uncreative, uninspired thinker, my buffalo foot!